Already enrolled? Access the course material HERE. 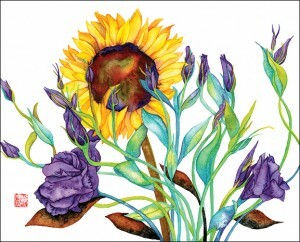 Lisianthus & Sunflower, by Sara Steele. All rights reserved. Used by permission. Have you ever found that the harder you try to change something in your life, the more unyielding it seems to become? Have you ever longed to be in a more peaceful relationship with yourself and your life circumstances? Have you ever found that you carry inner beliefs that are holding you back from what you know you could do and become? Have you ever wondered how you could partner with the Universe to bring forth the fullness of your potential? Does the time feel ripe for you to invite transformation into your life? If so, this course is for you. After the four weeks is over you will have permanent access to the course material for your ongoing use. For more information, please see the FAQs below. “My attitude and behaviors were remarkably influenced by my participation in Activating Transformation through the Power of Blessing. I was feeling restless about my work life and I was excited to find a teacher who used the words blessing and transformation together! The content and process is gentle and focused. I marvel at what I learned about myself and the power of blessing through this simple course.” ~Kelly B. “Activating Transformation Through the Power of Blessing is thought provoking, rich in wisdom, and creatively designed. I highly recommend joining Patricia on this remarkable journey of learning to say Yes to what is and to what can be. I trust this experience will open the way for new possibilities in your life as it has in mine.” ~Linda T.
“Patricia Pearce provides a powerful process to address the everyday issues that block the transformation we are seeking in our work or in our lives. She has a wise and calming presence and helps us to break down and move through challenges in our own way. It is a discipline I hope to return to again and again.” ~Abby S-H.
“Activating Transformation does just that from an arrestingly unique vantage point. Patricia’s wise teachings are presented in a highly accessible way (even to one such as I who is a bit dubious of on-line venues) and the stunning quality of the experience as well as its depth and power will surely activate transformation in you as it has in me.” ~Sue W.
“This is the best online course I have ever taken.” ~Frank T.
Registration for this course is currently closed. To find out when it will be offered again, please be sure to sign up for my newsletter here. If I register, how soon can I start the course? As soon as you register for the course you will have immediate access to the first week’s content. Each week thereafter you will receive an email letting you know that week’s lesson is available. Do I have to be available at a specific time to take this course? No. The course teachings will be presented as audio recordings each week which you can listen to whenever your schedule allows. Will I be able to access the course material after the four weeks is up? Absolutely. When you enroll in the class you receive permanent access to all the course material, so you can go back and review it whenever you want. You can also download the course content onto your computer hard drive. If you have additional questions about this course, please don’t hesitate to reach out to me through the contact page.